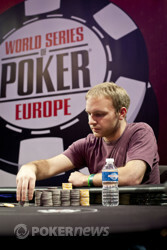 Tristan Wade wins his first 2011 WOSP Bracelet! Tristan Wade has become the fourth player to collect a coveted gold bracelet this week. He was one of the players who requested the blinds be pushed back today and this allowed him to sit back in the early stages, stay out of trouble and observe all those around him. We came back from the dinner break five-handed and a different beast returned. His VPIP percentage must've doubled as he began, with Michael Watson, to dismantle the field around him. He won a key hand versus Max Silver four-handed (KK v 44) that enabled him to eliminate the dangerous Brit who had position on him. It also to gave him the chips to compete with Watson, who was chip leader at that point after putting on his own masterclass. Once Richard Toth was eliminated in 3rd, Wade reached an even greater level of aggression in his play. He pounded his Canadian opponent and soon overturned the chip-deficit and grew a substantial lead. There was one key heads-up hand where he managed to maneuver Watson off a big pot when the board read and this seemed to break his opponent's spirit. Watson did manage to double-up when his king-ten over came Wade's pocket jacks, but moments later he was all-in again versus jacks. He was behind with ace-four and failed to find another three-outer. Wade showed class throughout the three days of play, and that goes for on the table and off the table. He was polite and courteous to all around him and is very a popular and deserving winner. Tristan Wade Wins His First WSOP Bracelet! Tristan Wade found the same holding as before and the hand played out pretty similar to that huge hand that played out. 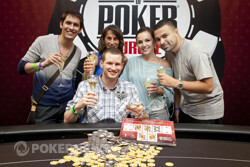 Michael Watson raised to 60,000 on the button and then moved all-in when Wade three-bet to 144,000 from the big blind. Wade snap-called with jacks again to create the showdown. The board ran to safely see the American home. Congratulations go to Watson who showed class and composure throughout. Michael Watson raised to 60,000 and Wade called. A flop reading saw both players check but when the landed on the turn Wade lead into his opponent with a 74,000 bet, a bet that Watson refused to call. Fans for both Tristan Wade and Michael Watson, eager, when the flop is dealt. Tristan Wade's relentless aggression paid off when as he had his man on the ropes and got him to make a move when he was holding the goods. Unfortunately for him, he couldn't get his hand to hold up. Wade raised to 60,000 from the button and snap-called when Michael Watson shoved on him for 507,000. The board ran . It was a dream flop for Watson and his hand held to the river. Time to start all over again. Tristan Wade is giving Michael Watson a lesson in big stack play right now and is not giving the Canadian one inch breathing room. Wade is continuously raising when he has the button and three-betting all in whenever Watson dares to open the betting. We have been very impressed with Wade's play since the tournament became short-handed, especially heads up. Michael Watson raised to 45,000 and then called when Tristan Wade three-bet to 112,000. 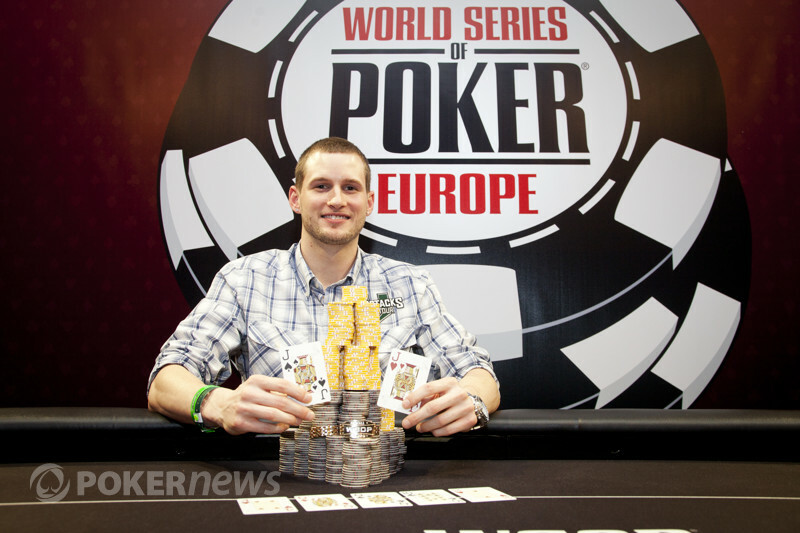 The flop came down a very draw heavy and Wade lead into Watson with a bet of 106,000. Watson made the call and we saw the land on the turn. Wade did not slow down, instead he bet 202,000 and sent Watson into the tank. He emerged a full minute and a half later with a fold. Watson looks slightly un-composed for the first time in this entire tournament. Does Wade not only have a two-to-one chip advantage but also a mental one too? Michael Watson is down to around 930,000 chips after giving up on a hand at the turn stage. He raised to 45,000 and Tristan Wade peeled to see a flop. He continued for 48,000 but was check-raised up to 118,000 by Wade. He called to see the turn where he quickly folded to a 210,000 bet. Tristan Wade with his first WSOP bracelet in the lobby of the beautiful Hotel Majestic, which host this years WSOPE. Fans for both Tristan Wade and Michael Watson see the flop on the all in.